Died Richmond Hill, Bath, England, 13 April 1894, "aged 69"
Jerome Carandini arrived at Hobart as a member of Anne Clarke's party of imported theatricals from London on 28 January 1842, in company with John and Frank Howson, and Emma Young. In his early appearances he sang Bellini arias and was billed as Clarke's "Director and Composer of the Ballet", also advertising that, late "Principal Coriféat the Italian Opera, London", he would give lessons in Dancing, as also in the French, Italian, and German languages". 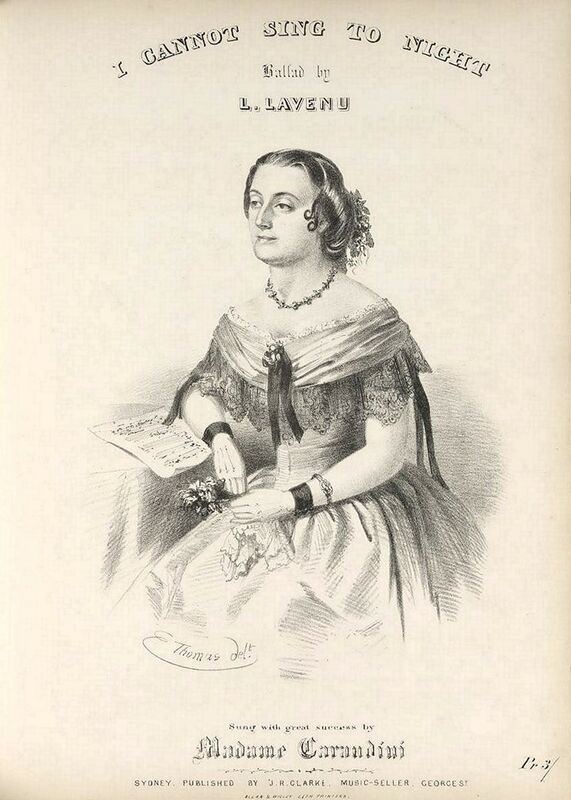 As "Mrs. Carandini", Maria made her debut in August 1843, and as "Madame Carandini" in Sydney in 1845. During the 1860s, the Carandini and her daughters (most notably Rosina and Fanny), toured widely, and shortly after Gerome's death in 1870 they travelled to New Zealand, Honolulu, and California. Maria gave her Australian farewells in Melbourne and finally Adelaide in February 1892. It is rumoured that Signor Carandini has regained his estates, and will shortly leave for Italy. It is reported amongst musical circles in Sydney that His Royal Highness was so charmed with the natural vocal powers of Miss Rosina Carandini, that he has determined to show his interest in a substantial manner. The Prince has, it is said, offered to defray the expenses of the musical education of Miss Rosina Carandini at the Conservatoire at Paris, or at any other musical school that may be chosen by competent judges of our Australian songster's talents. News that a private letter has been received by the last mail to the effect that Signor Carandini died of gastric lever and inflammation of the lungs on the 18th January, in Italy, whither he had gone to recover his ancestral property, which had been confiscated during a rebellion in 1836.
. . . Very slight changes occurred in the company at the Victoria after the conclusion of the Coppin performances until 1845, when Messrs. John and Frank Howson, Signor and Signora Carandini, and Mrs. Stirling (afterwards Mrs. Guerin, and finally Mrs. Stewart) arrived in Sydney, and were engaged for the Victoria. Their accession to the stage of the day led to regular productions of opera, but they were also important additions to the dramatic company. Mrs. Stirling frequently sustained leading characters in tragedy and high comedy, while for some years she was the prima donna of the operatic representations. Signor Carandini was an accomplished stage dancer, and succeeded another very excellent terpsichorean, Mr. Chambers. The Howsons and the Carandinis came from Tasmania . . .